Santiago Perez enrolled BPHC in a demand response program and identified a variety of opportunities for energy savings. 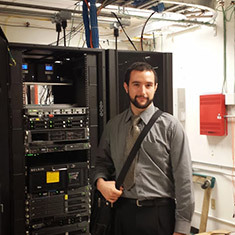 Santiago Perez, through his work at the Boston Public Health Commission (BPHC), worked to include the organization in a broader City of Boston contract to implement an Enterprise Energy Management System (EEMS), free of charge. The EEMS will provide an integrated dashboard of energy, water and sewage data to improve the organization’s ability to manage its consumption and evaluate the impact of energy efficiency projects. Perez also succeeded in enrolling BPHC in demand response. Additionally, he recommended several measures to improve the efficiency of BPHC’s Olympic-sized athletic center pool, including repairing a significant leak, purchase of a mechanical pool cover and installation of solar thermal air heating. His recommendations also included changing street lighting in the Boston Harbor Islands. Finally, he recommended installation of building-wide steam traps to prevent steam generated at its central power plant from venting into the atmosphere. The demand response program Perez implemented could generate revenue of $80,000 between 2014 and 2017 and $40,000 each subsequent year. The street lighting project in the Boston Harbor Islands could save the commission over $30,000 per year with a 3.5 year payback. The steam trap project could save nearly $40,000 annually and have an approximate two year payback equivalent to approximately 120 metric tons of carbon. Santiago Perez, a student at Baruch College, was hired as the 2013 EDF Climate Corps fellow at Boston Public Health Commission.